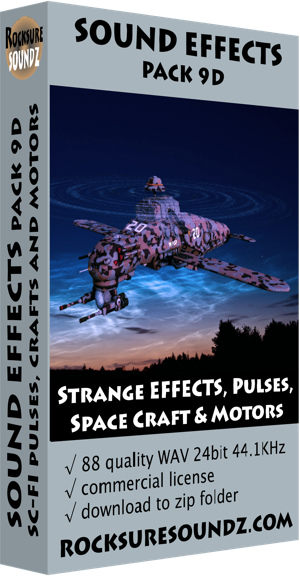 Sound Effect, Pack 09D Sci-Fi - Strange Effects, Pulses, Space Crafts & Motors. The fourth Pack in our Sci-Fi series, it covers a range of unusual sound effects that are hard to categorize through to space ships and motors, weapons and battle sounds. It has strange pulsing and alien radio sfx as well.